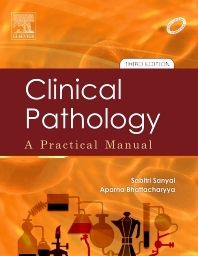 Clinical Pathology: A Practical Manual has been especially designed for medical undergraduate and medical technology students, laboratory technicians and clinical pathologists. It is also useful for the practicing microbiologists, pathologists and clinicians, and also to other healthcare professionals, paramedical students and practitioners. Provides in-depth knowledge of clinical pathology in question and answer format for quick learning and revision. Discusses procedures and methods of laboratory investigations along with interpretation and analysis of diagnostic data. Includes information on many new methodologies and technologies applicable to clinical pathology and medical laboratory technology. Includes five new chapters: Investigation of a Clinically Suspected Case of Anaemia; Platelet Disorders; Urinary Tract Infection: Laboratory Help in Diagnosis and Follow Up. Female Reproductive Tract Infection; Syndromes. Extensively revised and updated topics like collection of Blood; Haemolytic Anaemias; Blood Groups; Chemical Tests for Blood, Porphyrin, 5-HIAA in Urine; Examination of Sputum; Histopathological Techniques; Hi-Tech Instruments Used in Clinical Pathology.